The Iso grifo rivolta a3c restoration Rivolta A3/C was born in the early Sixties (1963-64) to be a real race car. During 1963/64 some race cars, called ISO grifo rivolta a3c restoration Rivolta A3/C, had been constructed and assembled by the engineer Giotto Bizzarrini to the order of Renzo Rivolta, owner of the ISO grifo rivolta a3c restoration Car Company. The ISO grifo rivolta a3c restoration Company paid for all the expenses and also sponsored the racing activities of Giotto Bizzarrini. The idea was to make the ISO grifo rivolta a3c restoration Rivolta brand "grew" in the race tracks after the success its GT had the year after, when it had been shown to the public for the first time. This was an absolutely prestigious car but for surenot made for racing. The racing version was made on a shortened GT chassis. Mainly the front and the rear cross member were used to be able to use the same suspension parts as the Rivolta. It was a welded sheet steel tub having a fully independent suspension by double wishbones in the front and a DeDion axle in the rear. The engine-gearbox was put more in the back and so the weight distribution was changed. 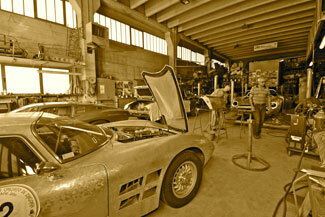 With the help of the "wind tunnel"a new aluminum body was designed by Bertone that was riveted on the chassis. 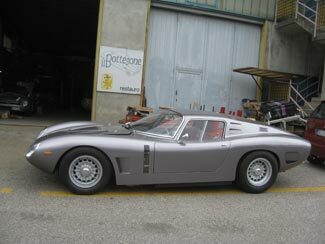 The result was this wonderful "Berlinetta" ISO grifo rivolta a3c restoration Rivolta A3/C. Only two of these cars were built during 1963/64: Chassis # 201 and # 202. From chassis # 203 on the name for these cars was changed and sometimes called ISO grifo rivolta a3c restoration A3, ISO grifo rivolta a3c restoration Bizzarrini, ISO grifo rivolta a3c restoration Grifo Stradale, Grifo 5300, etc. All these names were created and used by Giotto Bizzarrini without any support or involvement of the ISO grifo rivolta a3c restoration Company. Some of these cars took part in the Le Mans 24 hour race in 1964 and ’65. 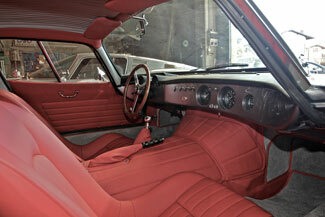 The ISO grifo rivolta a3c restoration Rivolta A3/C shown here is an original Sanction II. of the legendary ISO grifo rivolta a3c restoration Rivolta A3/C of 1963/64. Mr. Piero Rivolta gave his approval to name them officially ISO grifo rivolta a3c restoration Rivolta A3/C and to wear the Rivolta emblem. These cars are 100% correct and authentic, and remanufactured as per original factory construction drawings and specifications. The body, an all-aluminum masterpiece, and the entire chassis are hand crafted exactly the same way as the ones built during 1963/64. All parts used are the original and absolutely period correct ones. 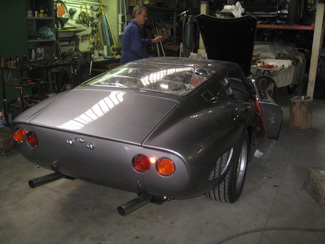 The cars are hand assembled with great craftsmanship by a small crew of specialists, who had worked with the original ISO grifo rivolta a3c restoration Rivolta Company. These A3/C Sanction II. cars are way more original than basically any of the remaining A3/C of 1963/64 which were often damaged or destroyed during races and had to be totally reconstructed and restored. The cars come with original Iso grifo rivolta a3c restoration Rivolta chassis # together with titles and documents from the donor cars which are used to provide original parts. Four of the Sanction II. 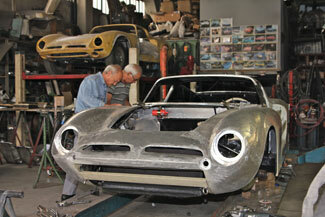 ISO grifo rivolta a3c restoration Rivolta A3/C cars were already produced and delivered to their proud owners. Another four A3/C is under construction for famous collectors worldwide. There are original parts and chassis left for only two more cars to be built. If you wish to own one of these very rare and unique, legendary ISO grifo rivolta a3c restoration Rivolta A3/C race cars please contact us. We are more than happy to help and assist you in any way to make your dream come true.